News on the AR grapevine is that Microsoft has cancelled the next version of the HoloLens, in order to be able to skip straight to the ensuing, more advanced, incarnation. According to Thurrott.com, that famous font of Microsoft rumours, the company has scrapped version 2 of the HoloLens, so it can begin work on the third version instead, and bring that to market quicker. Why? Inside sources claim that Microsoft is feeling no pressure from any rivals in the AR arena, and so believes it can get away without having to produce a v2 model, which would likely have been just a honed and more affordably priced version of the existing HoloLens. By fully going ahead with development of version 3, Microsoft can ensure it arrives sooner, and it’ll include new technology and be much more of an impressive ‘generational leap’ to keep ahead of the game. That certainly makes sense, but don’t think that HoloLens v3 will be arriving any time soon. Thurrott.com believes that the target release date is 2019, so it’s still a couple of years down the line at the moment. However, without this switch in the tack of development, we’d doubtless be looking at another year or two on top of that. The downside of this approach is that we are unlikely to see a cheaper HoloLens any time soon (which would have been the case with a v2 release). Naturally, this is all from the rumour mill, so take it with the usual pinch of salt, but Thurrott.com is regarded as pretty reliable when it comes to Microsoft-related gossip. 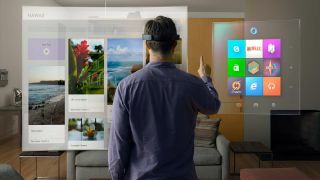 Of course, Microsoft will continue to work on and improve the existing HoloLens headset, so it’s not as if nothing will happen for the end user for the next two years. But this seems a sensible readjustment to make to the release roadmap, given that it will definitely be in Microsoft’s favour to make a big impact with the next full release of the hardware. After all, a fizzle with the next version could be fatal to the project.